Some weeks ago Martina Röll, the founder of Structure & Process, was interviewed by Karolina Iwa, in the context of Leadership Festival which will take place this summer in Poland. There is a recording of an online session that followed this interview available on Facebook. Martina was asked how she experiences working in an organisation that runs on Holacracy and what makes it stand out from more traditional ways of working. Here are some of her thoughts. You can do anything you wish. You have a general permission – a completely anarchistic general permission. You can simply act. Everybody takes on tasks they want to deliver and declares the time of delivery. You cannot assign tasks to anybody. And you cannot tell them how or when to deliver, either. You simply manage your own work. And if it happens that others do not deliver it the time they declared and you cannot wait for them – there is the underlying agreement to move on and do what you believe to be right. All the waiting and delegating falls away. This is extremely liberating. The mental drama of “but we are not ready yet” and “but we still need this and that” becomes obsolete. You just go. And if people do not deliver or no longer fulfil their tasks, they need to make sure they still keep their jobs. In Holacracy, jobs are not described by positions, but by the responsibilities and roles you take on. It is called “Do and let do”. When you allow this to be the rule for money too, you show people you really mean it. In Structure & Process anybody can spend up to 300€ for whatever they decide is important, without previously consulting with others. The only rule: it needs to help the organisation fulfil the organisational purpose. Holacracy gives you a very strong mirror. When you complain about others being a certain way and not different, at some point you just can no longer make it about them. You realize that it is actually about you. And all change will have to result from within you. This confronts you very strongly with questions like: If I am allowed to do anything, what is it that I truly want to do? What is it that I truly need? Holacracy brings you back to yourself in yet another way: it offers no space for expecting that others will guess what you need, or what you want. This is quite hard for some. It is not how we are socialised, mostly. So yes, it requires some practice – but this training in self-directedness pays back with a genuine feeling of more freedom and being less burdened. The self-organisation system is also great for high performers. Those are people who otherwise often struggle in teams and tend to feel torn between waiting for the others and not living their full potential vs. going their natural pace and feeling like they are a handful. A holacratic working environment allows them to go full throttle. To support the implementation, maintenance and development of the system there are some software solutions available. Structure & Process uses Glassfrog. You can have a peek at how an up-and-running organisation that operates on Holacracy looks like, see our structures, purpose, tasks and roles here. Want more? Check out our list of upcoming Holacracy Events in Europe! 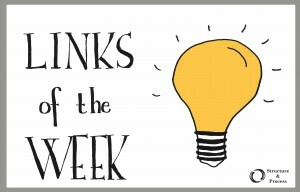 This week’s link collection features three articles on Organisational Development, one on Software development and one on the best way to get feedback from your customers. Enjoy! Sean Smith writes about a well crafted question that can get you magical feedback from customers. Where did he learn this? In Disneyland. Read his article on Medium. With some quotes of the most interesting articles from our link collection this week we say Goodbye for this year. Merry Christmas and Happy New Year! We will resume this column on January 11th. Are you working on a new product but don’t know yet whether there is enough interest in your solution? Inbound Rocket offers some useful tips how to talk to potential customers and get feedback for your idea: 5 Strategies We Used to Get Over 150 Customer Conversations. Aaron Dignet draws an interesting framework to systemise current approaches and experiments for a more open, fluid business organisation: He takes the head count of the company and their specific risk and puts together a helpful matrix for self-assessment: How to choose a model of self-organization that works for you. This is an article that is a bit painful to read when you are a person that loves to make plans and strategic decisions (like me). Chris Clark shares a conversation with Frederic Laloux about the steps that would normally follow a successful book like “Reinventing Orgnizations”. But Laloux keeps to his mindset shared in the book, refuses to make big plans and just has one major advice: Follow your personal answer to the question: “What’s next?” Where Is All This Teal Stuff Going? The Future of Reinventing Organizations. 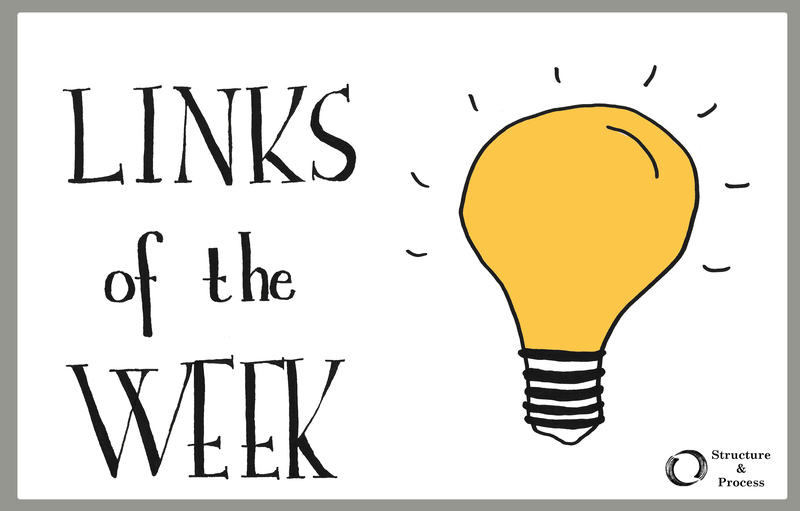 Here are our Links of the Week, curated from our link collection. Considering to change your organization model? This article points out some of the benefits of running on Holacracy and under which circumstances its adaption is most successful. 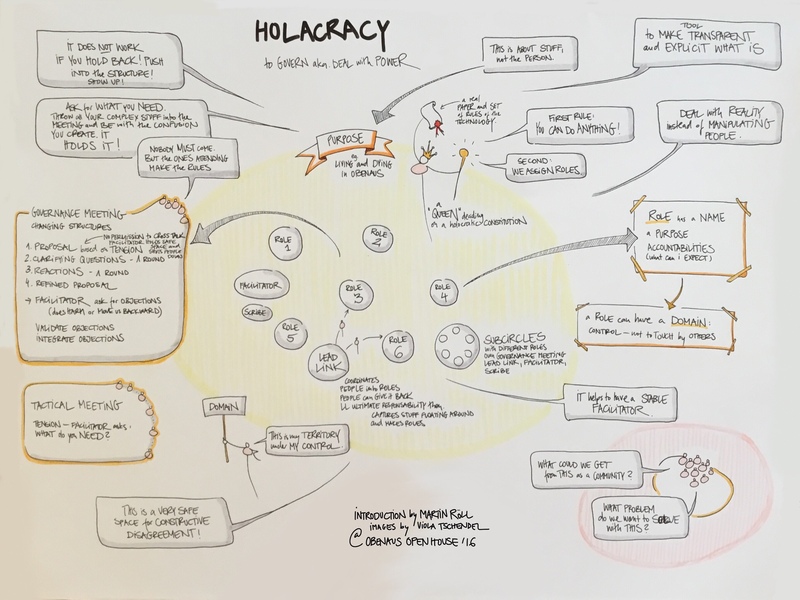 Is Holacracy Right for You? Here Is What You Need to Know. Voys and Devhouse Spindle have implemented Holacracy in the spring this year. In an interview the founder Mark Vletter gives a review of the process and how Holacracy changed his life. Six Month Holacracy. A love declaration to the white board. The article counts the pros of using a white board and explains its role in consulting work: Consulting confession: I love the white board. Tom Nixon offers an important clarification to Frederic Laloux book Reinventing Organisations. He emphasises the role of the founder of the organization despite the decentralized process in Holacracy or Sociocracy. The founder is the one who holds the space and provides the vision defining an existential value for the development and motivation of the people in the organization. Nixon develops his understanding of organisations further into an organic web of relations “and consider all of humanity as one interconnected ecosystem”. Resolving the awkward Paradox in Frederic Laloux’s Reinventing Organisations. Some good tips for those sitting at their work: Pay back your movement debt. Your body will be thankful. How to Reverse the Damage of Sitting and Human Domestication. Über Ideale, Erwachsenwerden, Weltverbesserung und Pragmatismus. Mit einem Schuss Kant. Man fühlt sich besser, wenn man versucht die Welt zu verbessern. … is one of the aspects I enjoy most, being part of a team that runs on Holacracy. if I should have done things differently. Or so is the theory. In practise, I still stress out a lot over being “a good leader”, a good steward of the team, a good Lead Link of our Holacracy Circles. I try my best. I work in the best way I can and let the rest flow through the Holacracy process: it allows and encourages anyone to come up with anything that could be improved (from that person’s perspective). It can then be processed constructively together and codified in our governance records, the standards by which we work together (more on how our company is set up here). Our conversations are mostly impersonal: they are usually about the work, not about the specific way in which a person is doing their work. The conversations happen between role holders for the benefit of the organisation. It is about how the work should be done, not about how I am or have been doing the work. Except when it actually is about personal performance: When a person is clearly not doing their job according to the agreed-on principles, our process also shows it very clearly and opens up a conversation about what can be done (should the job be reassigned to someone else? Does the person holding the role need more support?). This makes the conversation about changing the person’s job or reassigning their roles much easier than if it were mixed up with a conversation about the structure of the work. Having said all that, we do run into personal conflicts too. I hope that people will speak up, and address me personally when I messed up, or that they process it through Holacracy, so that we can all learn collectively, and build structure that may prevent future conflicts. Learning from the big fish in the pond: How storytelling improves consulting and makes it more fun. 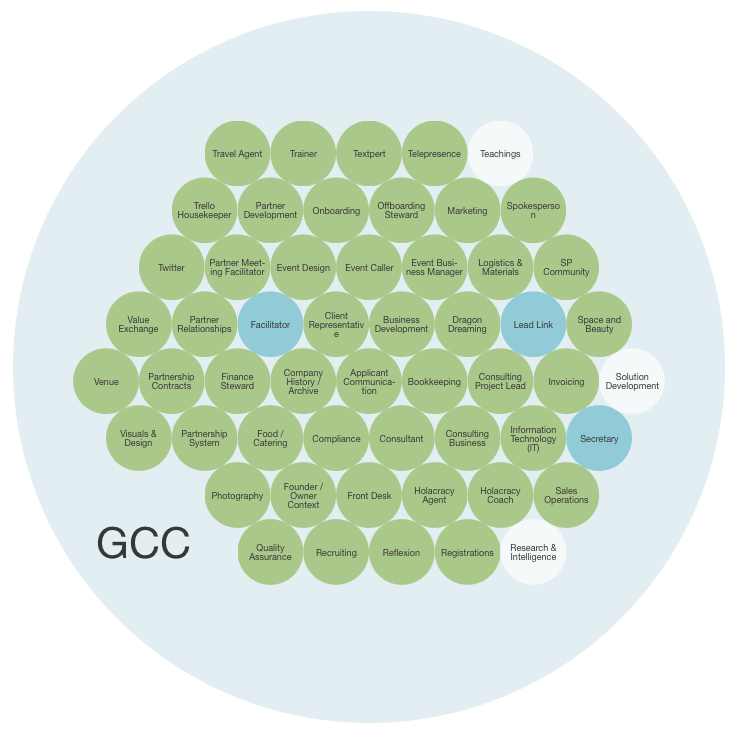 Consultants Mind analyses the Boston Consulting Group’s new website in Atlas of Strategy Traps. As a multi-local team, Structure & Process is working successfully with Slack. In this article Cary Newfeldt explains why this is such a powerful tool, and gives an overview of Slack’s functions: Hello Slack, Goodbye Email. Senjeev Agrawal advises only to start a new company if you are truly obsessed with your idea. In the end, even the worst case scenario looks like a total win. Don’t Start a Company – Be Obsessed With Something. Holacracy: it either fires you up or winds you up! Stefan Roock gibt eine illustrierte Einführung in Scrum und erklärt, wie diese IT-Methode als Denkmuster für ein agiles Innovationsmanagement angewendet werden kann. Check out our Holacracy Apps! We have published an overview of the “apps” we are using within our Holacracy practise. Feel free to pick them up and use them in your own organisation!